These close views of Pluto's four smaller moons were captured by NASA's New Horizons probe during its historic July 2015 flyby. Data from New Horizons suggests that at least two (and maybe even all four) were born from mergers of even smaller moons. Pluto, the dwarf planet that was once considered the ninth planet, has a growing entourage of satellites. The tiny world has five moons of varying size in orbit around it that tumble and dance in a strange and chaotic pattern. "The way I would describe this system is not just chaos, but pandemonium," Mark Showalter, a co-investigator on the New Horizons mission, said at a press conference last November. To the surprise of many, NASA's New Horizons mission did not turn up any additional moons during its historical flyby. Pluto has one very large moon that is almost half the planet’s size. Discovered in 1978, it was named Charon after the demon who ferried souls to the underworld in Greek mythology. (Pluto is named for the god of the underworld.) The huge size of Charon (750 miles or 1,200 kilometers in diameter) sometimes leads scientists to refer to Pluto and Charon as a double dwarf planet or binary system. Pluto's diameter is 1,473 miles (2,370 km). Pluto and Charon are just 12,200 miles (19,640 km) apart, less than the distance by flight between London and Sydney, Australia. Charon's orbit around Pluto takes 6.4 Earth days, and one Pluto rotation — a Pluto day — also takes 6.4 Earth days. This means Charon hovers over the same spot on Pluto's surface, and the same side of Charon always faces Pluto, a phenomenon known as tidal locking. While Charon is mostly gray, its northern pole has a reddish tint. Most of the moon is covered with water-ice, but the red region is likely made up of shredded pieces of Pluto's atmosphere. The moon has a surprisingly young surface, suggestive that it once housed an ocean in its interior, one that would have long ago frozen. Compared with most of solar system's planets and moons, the Pluto-Charon system is tipped on its side in relation to the sun. Also, Pluto's rotation is retrograde compared to the other worlds — it spins backwards, from east to west. 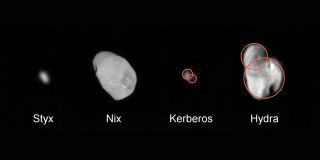 In 2005, as scientists photographed Pluto with NASA's Hubble Space Telescope in preparation for the New Horizons mission — the first spacecraft to visit Pluto and the Kuiper Belt — they discovered two other tiny moons of Pluto, now dubbed Nix and Hydra. These are two to three times farther away from Pluto than Charon. While NASA's New Horizons mission was able to capture significant details about Charon during its 2015 flyby, it was only able to view the other four moons from a distance. Still, it provided the best look at the satellites to date. The spacecraft revealed details as small as 2 miles (3 km) on Nix and 0.7 miles (1.2 km) on Hydra. The mission also provided the best measurements for the tiny moons. Nix is estimated to be 26 miles (42 km) long and 22 miles (36 km) wide, while Hydra is 34 miles (55 km) in length. Hydra has a shape resembling a mitten or a rubber duck with at least two large craters. The moon resembles Comet 67P/Churyumov–Gerasimenko, which Europe's Rosetta mission has been orbiting since August 2014. Scientists think that Comet 67P may have formed when two separate bodies merged, and the same process may have played a role in the formation of Hydra. Hydra was the nine-headed mythological serpent that guarded Pluto's realm. The irregularly shaped Nix looks much like a jellybean, with a surprisingly big impact crater. It is not as bright as Pluto, though brighter than Charon. In Greek mythology, Nyx was the goddess of the night and mother of Charon. The spelling was changed to Nix, the Egyptian goddess of night and darkness, to avoid confusion with two asteroids of the same name. "Nix isn't very large, and there is a very fine line between an impact that will make a crater that big and one that will break Nix apart," New Horizons team member Simon Porter, of the Southwest Research Institute in Boulder, Colorado, wrote in a blog post. "So, either Nix was very lucky in surviving that collision, or it's a fragment of an older moon that was somehow destroyed." All four of the small moons appear to be coated by relatively pure water-ice. Scientists using Hubble discovered a fourth moon, Kerberos, in 2011. New Horizons revealed that the moon has two lobes, one about 5 miles (8 km) wide and the other about 3 miles (5 km) in diameter. Like Hydra, it may have formed from the merger of two separate objects. Kerberos orbits between Nix and Hydra. Despite its small size, Hubble observations revealed that it exerts a strong gravitational influence on the neighboring moons. Before New Horizons arrived, scientists thought the moon might be large but dark, keeping it obscured. Instead, the moon is small and bright. The moon was named for the three-headed dog in Greek mythology (Cerberus to the Romans). The fifth moon, spotted in 2012, is named Styx after the river separating the living from the dead. It is estimated to be irregular in shape and 4.5 miles (7 km) wide. It is in a 59,030-mile (95,000-km) diameter circular orbit around Pluto that is assumed to lie in the same plane as Pluto’s other known moons. Scientists anticipated the discovery of more moons when New Horizons arrived at Pluto, but none were spotted. Pluto's entire moon system is thought to have formed by a collision between Pluto and a similar-size body early in the history of the solar system. The collision threw out material that coalesced into the family of satellites orbiting Pluto. New Horizons found that the four moons were surprisingly chaotic. Hydra is the fastest-rotating, spinning once every 10 hours during its 38-day orbit of Pluto, or 89 times every orbit. "If Hydra were spinning much faster, material would fly off its surface due to the centrifugal force," Showalter said in a statement from NASA. The other three moons rotate between 6 to 10 times during their orbit, which is still surprisingly fast. In addition to that, Nix is tilted on its axis by 132 degrees and rotating backward. Such rapid rotations are surprising because the gravity of Pluto should slow down the spin of the smaller moons. "The question is, why [don't they] slow down? It's not so much why [are they] so fast. … There's clearly something fundamental about the dynamics of the system that we do not understand," Showalter said in the statement. Additional reporting by Nola Taylor Redd, Space.com Contributor. Follow Nola on Twitter @NolaTReddor Google+. Follow us at @Spacedotcom, Facebookor Google+. Originally published on Space.com.